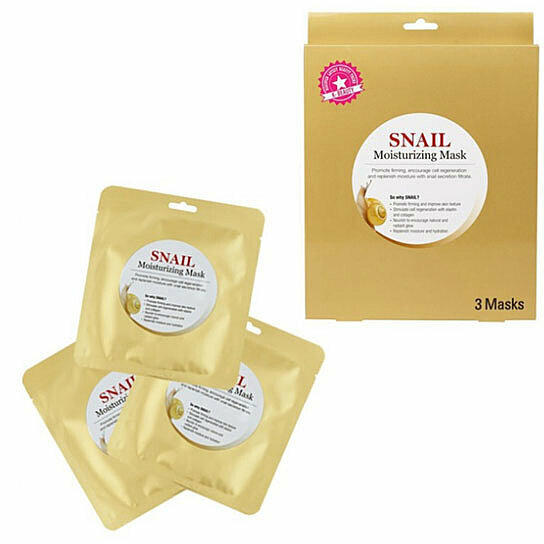 Snail Moisturizing Mask contains snail secretion filtrate and an essential combination of moisturizers to hydrate, brighten and revitalize skin to draw out a healthy, natural, and radiant glow that comes from within. After cleansing, apply toner to refine your skin texture. Take out and unfold the masks. Place the mask on the face. Smooth the mask gently to ensure good contact with the skin. Gently pat residual serum into skin. Do not use if you are allergic to any ingredients. Stop using if skin becomes red, swollen, itchy during and after use. If pain persists after the mask is peeled off and above signs occur, discontinue immediately and consult your doctor.